beach. With so much to do on your doorstep in the historic 1066 country, this holiday cottage is the perfect location for a family holiday or short break throughout the year. With many castles, historic sites, water sports, golf and of course the huge sandy beach this holiday cottage will keep all ages entertained. The Rock has been beautifully furnished with comfort in mind and has a sunny landscaped garden which is perfect for relaxing in at the end of the day. The medieval town of Rye with its boutique shops and restaurants is only a few miles away and can be explored from the comfortable base of this baby friendly holiday cottage in Camber Sands. The Rock is ideally located in White Sand, an award winning development just a few minutes' walk from the famous and breath-taking Camber Sands beach. Whatever the weather, the Rock is comfortable and relaxing and invites you to relax and unwind. The Rock is a modern three bedroom holiday home, offering spacious living areas. The ground floor features a generous living room and a large open plan kitchen/dining area leading to the landscaped garden. A perfect combination for entertaining. The first floor comprises a large master bedroom with en-suite bathroom, complemented by two further good sized bedrooms and a family bathroom. The Rock is a substantial 3 bedroom holiday home that has been imaginatively furnished in an appealing, contemporary, seaside style. The open plan kitchen, dining room leads to the landscaped garden with bespoke seating area, great for groups of friends or families alike. Meanwhile, the slightly more formal bright and sunny sitting room has an L shaped sofa, perfect for relaxing on after a day out in historic 1066 Country. The Rock is equipped with guest's enjoyment, relaxation and comfort in mind. One particular highlight is the sunny, south-facing, decked patio garden complete with barbecue, dining table and chairs- a perfect spot for relaxing in the sun or with a beer after a day on the beach. Watersports and golfing devotees will appreciate the secure garage for storing wet suits, boards, golf clubs etc. With seaside spirit at the heart of every room, The Rock offers a delightful 3BR escape just a three-minute walk from scenic Camber Sands beach. Enjoy sunny, spacious living areas and a tranquil south-facing garden with room to dine, gather, and make memories. Discover White Sand, where country meets coastal. Wander down to the beach or bike or walk through calming countryside trails. Then come home and rest up in cheery bedrooms with sea-inspired accents. Plus, you're just 10 minutes from medieval Rye, a historic town where culture and dining await around every (cobblestoned) bend. This house is perfect for a family holiday whatever the time of year. All of the rooms are really cosy, bright and modern and have everything you need. The beds are very comfortable too. We stayed there as a family of 6 adults plus 2 dogs and it was more than big enough to accommodate us all. The location is also great being only a few minutes walk to a very friendly pub, The Owl, which serves great food, as well as a large local Nisa and of course a fantastic sandy beach, where the tide seems to go out forever. We all thoroughly enjoyed our week at the Rock and found it had every facility to keep baby and dog safe and happy, likewise the adults! Welcome treats were special, thank you. Lots to explore in the area and enjoyed local pubs such as the Kings Head, The Plough, the Gallivant and the George. Luckily the weather was good too so many walks in Rye Harbour , Winchelsea and Dungeness. We all agreed that we will miss the Rock and hope to return soon. Thank you from Christine , the Coles and Molly the dog. We thoroughly enjoyed our stay at this fabulous property. Everything was at hand and our 3 year old grandson had a great time with all the toys supplied. Welcoming cake, biscuits and juice and prior to our arrival, in depth information sent to us by the helpful hosts. I would highly recommend this stay as it is literally 5 minutes from the beautiful sandy beach, lovely pubs for food and very near delightful rye and the Romney, hythe and dymchurch miniature train. Lovely house - clean, modern, all you need for a great family stay. Spent a long weekend here with 4 adults and 2 young children. Great accommodation, everything we needed for a great stay. Clean, quiet, contemporary, comfortable but with lots of added luxuries. The owners have really thought through what families look for when choosing somewhere to stay and gave us loads of useful information on the area. Little details like travel cots, toys, a Wii to entertain the kids, flat-screen TV's, Wifi and even a Bjorn chair for babies. Absolutely spot on...would stay here again without hesitation if we were visiting the area. Thank you very much for taking the time to submit this fab review! We look forward to welcoming you back again soon. We had an amazing stay in this beautiful house. 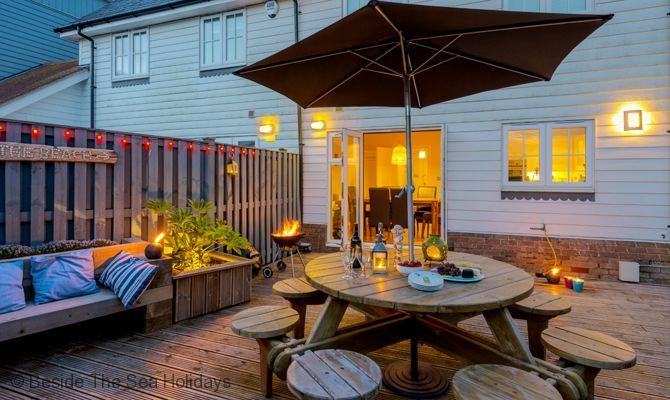 It has everything you need and more to enjoy cosy family holiday in Camber. We are looking forward to coming back. Thank you very much for the lovely review, look forward to you returning again soon. Prices include bed linen, towels, all utilities, travel cot, stair gate, high chair, pre-arrival and departure cleaning. Guests will need to supply linen for the travel cot.